While playing in-game, you may encounter some bugs or glitches. If possible, I'd like to list all of them and their causes and/or solutions here. So, please feel free to post a reply adding any that you know of! And of course, if you have any questions, these solutions don't work, or encounter other problems, you can always @gm/ask in-game, ask on xat, or make a thread! Leave any party that you are in, and do @expfix. First try logging into a different channel. If you're getting an error code, check for it's solution on this thread. If you're getting an error relating to something like "Reached end of file: 38", either try another channel or move your character to Henesys using the control panel on the [url=null]ModernMS website[/url]. See the next solution for more information. 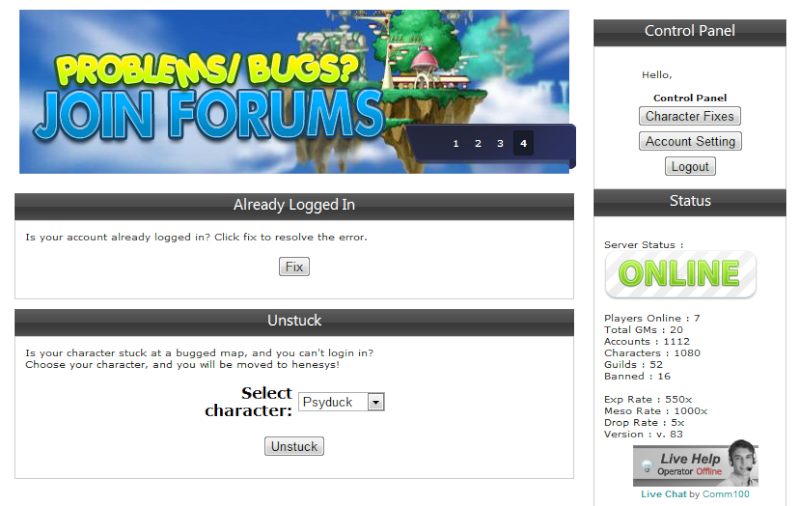 ID is already logged in --> Just let us know on the xat or forums for now. Log into the website and click character fixes on the right, in the same spot you logged in. Then click 'fix'! Here you can see your options upon selecting character fixes. This bug happens if you max your base stat to 32767. It's best to keep it at 32000 maximum. And you can get an SRB when you've got 30k for all of your stats anyways! To fix this, you've got to @fmnpc -> stat reset. Even if you don't see all your AP being returned to you, it really is there. Just redistribute it to your stats! Not sure what causes this bug. If you have it though, when adding someone to your buddy list, let them add you, and then you add them. Or you can add them and then ask them to add you.